Is today’s true innovation the one which we can’t see? 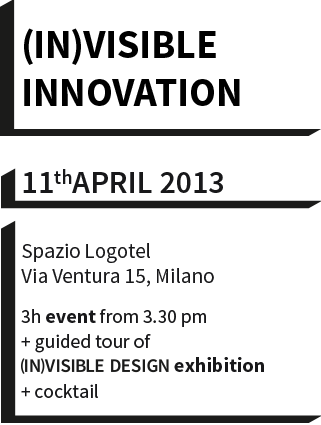 In order to answer this question, the schedule of the (In)visible Design week also includes the (In)visible Innovation business event: a meeting for exploring the frontiers of the innovation which can generate new valuable processes, models and, most of all, people – even without making an impact on customers with tangible products. An afternoon together for tracing and anticipating the transformations going on within our companies: a conversation between business and design, aiming at investigating how and why the real urgency today is to (re)design processes, to (re)shape organizational models, to (re)start from people.